Patent Acquisitions – Where to find Ideal Patents to Mitigate risks during Foreign Expansion? Lack of IP poses a challenge of patent infringement not only within the country but also when companies plan to go global – They are welcomed with lawsuits. At such a time, patent acquisition of foreign assignees helps support the goal of having global business operations. Decision makers, however, face the dilemma on what to do next, which strategy to follow and which one to avoid. Also, in order to make the acquisition of foreign intellectual property rights plan a success, you need to be having some proven strategy under your sleeves. Otherwise, you will be throwing spaghetti on the wall to find out which strategies are promising and are working. Why target universities during your patent acquisition campaign? Why are small businesses with great IP ideal for patent acquisition deal? Xiaomi, for instance, is one such company, which in the pursuit to expand to the US market met a not so welcoming fate. Blue Spike, a US based Patent Assertion Entity, sued Xiaomi for infringement against US patent 8,930,719B2, titled “Data Protection Method and Device“. Blue Spike claimed that the patent was used by Xiaomi without permission in various models of including the likes of Xiaomi Mi4 LTE, Xiaomi Mi4c etc. Blue Spike also included Xiaomi’s Mi5 in its complaint, which was supposed to launch the next month, with a hope that Xiaomi would pay the damages quickly to avoid delaying the launch of their eagerly awaited flagship device. The US wasn’t the only country, Xiaomi faced similar lawsuits in other countries as well. Upon entering Indian lands, for example, Xiaomi was sued by Ericsson, and Delhi High Court granted an injunction barring Flipkart selling Xiaomi’s cell phones across India. Amidst these lawsuits, Xiaomi realized the value of IP and it decided to nip the problem in its bud. What Xiaomi did next change the direction of the company. How Xiaomi Used Patent Acquisition in its Global Expansion Plan? In addition to filing organic patents, Xiaomi followed the path of patent acquisition. It acquired a large number of patents through licensing and acquisitions from a variety of sources. From 35 patents in 2011 to 8600+ patents till date, Xiaomi has successfully ventured into a lot of markets with the help of its acquired IP. You can find a detailed report on Xiaomi’s patent acquisitions here: Xiaomi’s Global Expansion Plans are steered by Patents. While reading the article you may ask yourself a question: how Xiaomi figured out which company to approach for patent acquisition so that they can save themselves from patent lawsuits? Or how I should figure out which university or company should be approached for purchasing or licensing patents in a geography to avoid lawsuits. It can’t be stressed enough that patent acquisitions are the quickest solutions to avoid IP roadblocks while expanding to other horizons. But, Patent acquisitions aren’t any easy task either. Sure, if you want to have a strong patent portfolio, you need patents to strengthen it. But in a new market, the question remains: Where can I get access to good Patents? 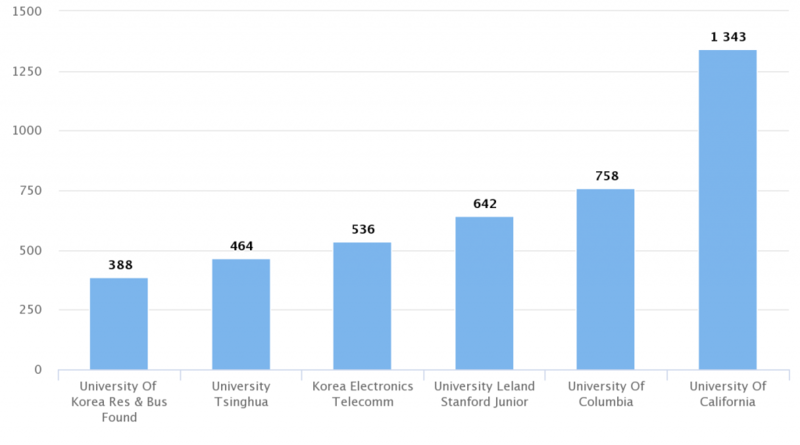 Universities are one great answer to the question where can I get access to good Patents? With thousands of patents in their portfolio, Universities are a hub spot for innovation and an amazing resource to get hands on key patents of a technology. The patents owned by a university are a clear indicator of the direction of research and this insight can be further used to establish liaisons or collaborative efforts. For instance, if you are working in communications domain and intending to extend operations, these are the top 6 universities researching on communication domain you should consider acquiring patents from. Universities indulge in quality research, at least comparatively, and it might occur to one that their patents generate good revenue. Truth is, they usually don’t. Because they are mostly overlooked. Which in no way has any correlation to any of these patents being low-quality. In fact, they are so good, NPEs display a special interest in acquiring patents from universities. Take Intellectual Ventures Holdings, for instance. The Famous NPE, with one of the biggest portfolios of U.S. patents, frequently buys university patents. It has purchased many patents including the likes of US6313482, US5233215, and US5396085 from North California State University. Not only IV, even government organizations like National Institutes of Health (NIH) prefer buying patents from universities. For example, US8263104 was bought from Northwestern University by NIH in 2011. It goes on to indicate that universities have some very valuable patents which most companies outside are seeking for and when acquired may strengthen an existing patent portfolio of a company. Word of advice– While looking for university patents for acquisition, don’t overlook small universities as you can find gold in their portfolio, too. Of course, there are large universities like MIT, University of California, which are an obvious choice for any company looking for patents, but there are other small universities as well that can offer you some gems. Further, another great option you should take heed to are university professors, working on your technology of interest, who are open for a partnership. When brought in, they could help your R&D team(s) build strong patent portfolios. Let “Don’t overlook small” be your Mantra. When entering a new market, “I can do well all by myself” is definitely not a good mindset, especially as the lack of IP can be a sword of Damocles in form of patent infringement. M&A for the sake of IP protection is a common practice followed by almost every major company. Let me give you one instance among the multitude of instances. In September of 2015, Amazon acquired Elemental Technologies, a back-end mobile video service for $500 million. This was a tactical move to strengthen the patent portfolio of Amazon Web Services (AWS) in cloud infrastructure services. This move not only added more value to the company but also provided strength to their portfolio. Here you have to brainstorm to select an optimum path among the two. If you go with the option first, you know what to do. The process is simple and your attorney may help you out. If you choose the second option, however, we have a strategy for you. If you find that going offensive is beneficial and you want to get a hold on some patents that can help you countersue the plaintiff(s), the best way to acquire patents is by looking at the portfolio of popular NPEs (Non-Patent Entities) in that geography. Why NPEs? Because NPEs don’t practice their patents but sell or license them. Thus, if you find a patent in their portfolio, you can approach them to purchase or to license a patent of your interest. Yieldify denied all of the allegations and taking an offensive step counter sued the rival accusing it of infringing patent US8,806,327. Yieldify was not the original owner of the patent. It purchased the patent from Intellectual Ventures (one of the most popular NPEs) in 2016 to open up a new front. Both the companies finally came to an agreement, dropping various law suits and granting each other the required licenses. This goes on to prove that knowing popular litigators in geography could help you overturn the case in your favor. Also, you can have a look at the mortgaged patents of your tech domain. The owner of the patents will be more willing to accept your offer. You can find more information on acquiring mortgaged patents here: Why to focus on mortgaged patents? Similarly, there could be companies which have patents but are inactive in that technology domain. These companies might be willing to sell these patents and could provide some value leads in acquiring strong patents. Also, there might be companies which are not present in that geography but have patents in that region. These companies could act as a helping hand in acquiring or licensing the value patents and could provide strength to your patent portfolio. Ignoring IP might have some serious implications as it plays a major role in making and breaking businesses. Strong patents do not only strengthen your patent portfolio, they determine the future of your company. While expanding the business to a new region, it is very important to have patents covering your technology in that region, and having a solid knowledge of ‘where to acquire patents from’ is a boon. Having good patents in the portfolio could serve as the backbone of your business not just in market expansion but also in business growth. Authored by Gaurav Sharma, Associate IP Solutions in collaboration with Lindce Sabi Varghese, Team Lead IP Solutions and Vikas Jha, Manager IP Solutions.